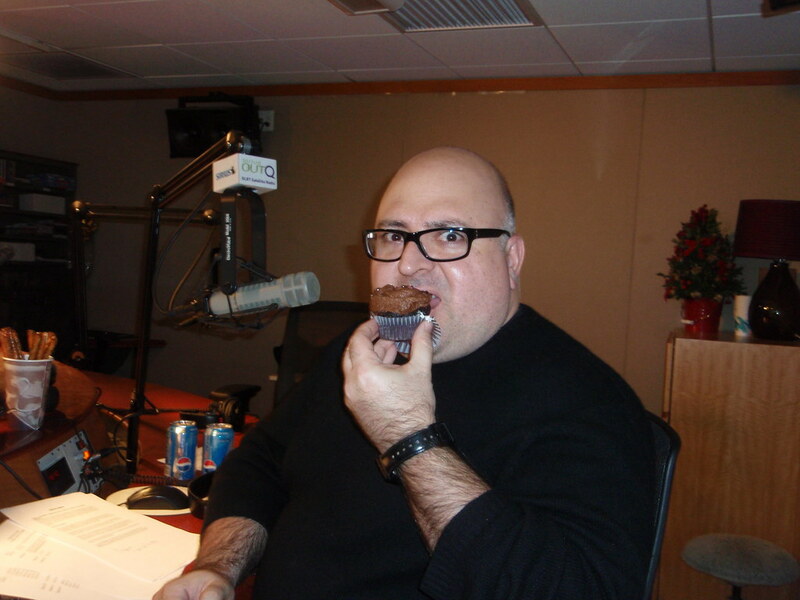 Frank DeCaro had us on his Sirius show because he loooooves cupcakes. Here's his official bio followed by our interview. A much sought-after pop culture pundit, he has appeared on numerous programs including TV Land’s Tickled Pink, Logo’s kickoff program The Evolution Will Be Televised, CNN’s Showbiz Tonight, NBC’s Dateline, VH1’s The List with Ashton Kutcher, E! Entertainment Television’s The E! True Hollywood Story: The Sopranos, and Bravo’s Bravo Profiles: Ru Paul. Why do you love cupcakes so much? Cupcakes are really cute and you don’t have to share them. Plus, my mother baked a lot when I was growing up and even though she used Duncan Hines mixes a lot of the time, her cupcakes rocked. What's your favorite place to get cupcakes? In New York, I like Billy’s Bakery in Chelsea and Sugar Sweet Sunshine on the Lower East Side. In Los Angeles, I always save room for a cupcake at Toast. What makes a cupcake a good one (or a bad one, if there's such a thing)? I always split the cupcake horizontally and put the bottom on top. It’s like making a cupcake sandwich with the frosting in the middle. You said that you sometimes bake cupcakes, but have had trouble with getting the frosting right. Which recipe(s) do you usually use? What's been your best cupcake baking experience? Everyone at work goes nuts when I made Lickety Split Strawberry Cupcakes. It’s a tacky Pillsbury Bake Off recipe, but they love them. You add sour cream and eggs to a box of that pink, strawberry-flavored cake mix. You fill the cupcakes up part way, drop a teaspoon of strawberry jam on top of that, and then cover that with a dollop of the cake batter. Although the recipe doesn’t call for icing, I think they benefit greatly from a good slathering of cream cheese frosting. I also top them with red sprinkles, because cupcakes should always have sprinkles. Can you tell those who've never heard your Sirius show what they can expect? It’s three hours of glitz, glamour, and gonads from 11 am to 2 pm Eastern every weekday on Sirius OutQ 109! You have a lot of celebrities on your show. Which celebrity would you most like to feed a cupcake to? Cheyenne Jackson, the star of Xanadu on Broadway. He couldn’t be sweeter or cuter. Or Kevin McKidd, who starred as Lucius Vorenus on Rome on HBO. Around our house, we called him Luscious Vorenus! What's your fantasy cupcake flavor (one you've never seen but would love to eat)? The ease with which one can hide the evidence he’s eaten too many. Chocolate with white frosting, or ooey gooey coconut. I’d like to see the end of the miniature cupcake. They’re just silly. Entenmann’s cupcakes were the first six-pack I ever consumed. I don’t kiss and tell, except on my radio show.